No. 17, Jalan TP 7/7, Section 26, SIME UEP Industrial Park, 40400 Shah Alam, Selangor, Malaysia. GPA Pumps started many years back by a few pump professionals that process great passion in designing pump and pumping system. Our business has since expanded from a humble servicing workshop to a well-known pump company named GPA Pumps with head office located in Australia. 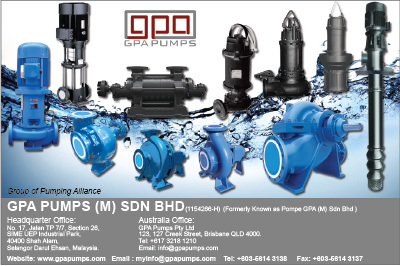 GPA Pumps supplies a variety of pumping solutions to suit the market needs. We provide sales and after sales services for our specialized pumps being used in the Water Treatment, Building Services, Power Plant, Oil and Gas industries. Our products range includes high pressure pumping, water supply, waste water treatment, flood control to commercial HVAC, and many more. We are represented in many countries with good support network to meet our customers’ needs efficiently. We will constantly update our pump manufacturing technologies to provide the best pumping solution with highest efficiency.